Dr Iyabo Ojikutu (formerly Dr Okuwobi) is a board certified pediatrician, and fellow of the American Academy of Pediatrics. She received her medical degree at the College of Medicine, University of Lagos, Nigeria. She has been practicing medicine since she was 22 years old, and currently owns, and runs her practice in Atlanta, Georgia, where she lives with her two daughters. Permanent Happiness is her first book. Her writing began in December 2015, after her dear father passed. Welcome Dr. Ojikutu, and thank you for being with us today! Why don’t you start by telling our readers a bit about your journey to becoming a published author? I’ve been a practicing physician for 25 years. I had no idea I would be suddenly inspired to start writing books. This happened in December 2015. My dad passed suddenly in October 2015 at 86 years old. I was grieving and spending a lot of time in solitude reflecting on the wonderful role he played in my life, and one glorious day in December 2015, I had an inner urge that was inspiring me to pick up my laptop, and start typing away. I started to transcribe all my thoughts and feelings down, and word after word, sentence after sentence, I had written almost 60K words before the end of Feb 2016. I realized I had created a book, detailing my life story as well as ways I had found happiness for myself so far in my life. I started to research ways to get it published. I decided to go for traditional publishing, and I spent the entire year of 2016 sending my manuscript to agents and publishers, with no luck. I also attended some book conferences and pitched it to agents there. In 2017, I decided to self-publish, and I put together my own team of editors, a graphic designer, and formatter, and my book was on Amazon on May 24 2017! I also had written a second book behind the first one, which I started in Feb 2016 and completed in April 2016. This one is not yet published. Hopefully soon! What is Permanent Happiness about? 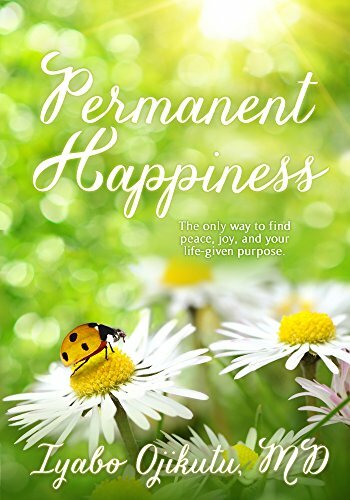 Permanent Happiness is a book about inner peace, which is permanent happiness. What makes this one different? Is this really an achievable state of being? What does this one have to say that we have not heard before? As you pick this book up, those questions start to come up in your mind. We will never stop craving happiness. It is the most sought after feeling, and emotion. As we wake up each morning, consciously or subconsciously, we are hoping to find happiness in all we do. We, of course, do find happiness at different points and phases in our lives. Problem is, those tend to be short lived, and wax and wane a lot. We are happy for two days, then fall back into despair, sadness or other negative cycles for several days. Permanent Happiness is uniquely different. It outlines 3 easy steps to achieving permanent happiness. Each chapter tackles every key life situation we encounter during our daily living. You will also read about my personal life story. Permanent Happiness will challenge and inspire you. Get ready to learn about happiness from a different perspective: Permanent Happiness-Peace. My dad’s passing in October 2015 was the catalyst and inspiration behind this book’s creation. What is the key to permanent happiness? The key to permanent happiness is the realization that the source and the path lies deep within each of our souls. It is already within us, we just have to wake up to it, and make use of that inner strength to find happiness permanently. What is it you most hope readers take away from the message in Permanent Happiness? That only ‘they’are responsible for their own inner peace, inner strength, and permanent happiness. No human, absolutely no one can take up that responsibility for them. Tell us about the response you’ve received from your book thus far. It’s been great so far. I’ve received a lot of positive feedback! Some readers only feel comfortable messaging me privately and letting me know the different ways my book has touched them personally. I’ve received many great reviews on Amazon and Goodreads, as well as fantastic reviews from book bloggers, and book reviewers; of which Reader views is one. What do you like to read, and what book has most influenced your life? I read mostly non-fiction; memoirs, biographies, self-help, relationship, spiritual, Christian and inspirational books. I’ve been inspired by several books by Deepak Chopra, Iyanla Vanzant, Andy Stanley, Bishop TD Jakes, Steve Harvey, to name a few. In my free time, I make myself a cup of herbal tea, of which honey lemon ginseng is my favorite, do some writing, or read a good book, and hang out with my dog, a golden doodle named Luca. Or hang out with my daughters, if they are free. I also love to take walks. Travel is one of my favorite things also. I have traveled to many countries in the world, but still have several to visit and explore. Yes. I have a second completed book, which I finished in April 2016, but not yet published. I’m currently writing my third book. Do you have a website or blog where readers can learn more about you and your works? Oh yes, I have a website. www.driyabo.com where readers can learn more about me, and my blog is called The Peace Place, and it is also on my website. I am on Facebook, Instagram, Pinterest, Goodreads, Twitter, Linkedin, and You Tube. You can connect with me on all my social media sites through my website at https://www.driyabo.com/join-me/. Tell us about your new You Tube channel. What kind of information do you have available in your videos? I have short 1-10 minute videos on You Tube which focus on several topics on self -development, growth and empowerment. I also have videos from my speech and involvement at the United Nations SDG Media zone from last September 2017. The best piece of advice was from my dad. As a child growing up in Nigeria, he would repeat over and over: “Iyabo, education is very important. You must always read your books.” He is correct. Books have changed my life in every way – not just my academic books, but business books, and all the other non-fiction inspirational books I read for pleasure. Books give you power. Books give you knowledge. Books are the greatest gift from one human to another human. Yes. If you have had a dream to write, and you don’t know where to start, or what to write about, start with your life story. Or if you would rather write fiction, transform and modify your life story into fictional characters, and just imagine away. If you are still alive and breathing, you have a life story others can read and benefit from. But, remember to carve out a peaceful, quiet spot in your home, or outside your home to write. You want to cancel out all external stimulation as much as possible. Also, always have a pen and paper, phone or other device handy to make notes, because the more you write, the more thoughts and ideas will come to you randomly everywhere and anywhere. Pen them down as soon as they come to you. Otherwise, you may not remember them. Be open. Let the flow of life happen. Do not be too rigid or over-plan your life path. Life may have an entirely different plan and path for you to take at a point in your life. If you are set in your ways, and not receptive to the silent whispers and urges that will come to you, you may miss out on your true life-purpose.